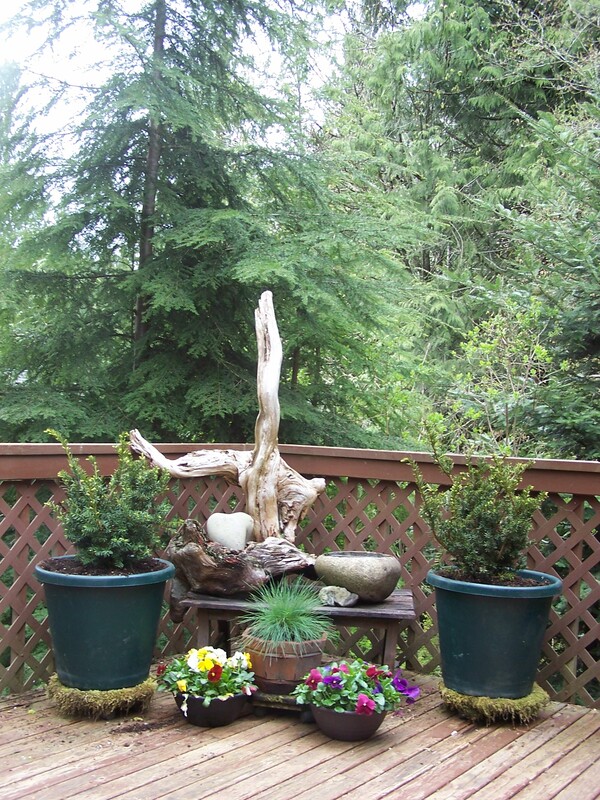 On Christmas Day, 1995, as I planted two small Yew trees (traditionally seen as sacred trees, and known for their healing properties) near my meditation spiral, I realized that these “Angel and Cradle” driftwood pieces, and a large, heart-shaped rock I had recently found on the beach at Camano Island, were the perfect memorial for my recovery from a double mastectomy for breast cancer. It was, of course, an even more perfect symbol for the Incarnation, as the Angel hovered over the Holy Child resting in the simple Cradle shaped only by the hand of God. When moving from Camano to Bellingham, the Angel, cradle and heart-rock came with me, standing guard for years near the entrance to my Anchorhold. The Yew trees, however, stayed behind. This spring something deep within my soul stirred, and I knew it was time to bring the Angel closer. She now resides on my back deck, still hovering over the Cradle and Heart-rock. And on either side are dwarf Yew shrubs. And beside the Cradle is a stone basin in which the birds delight as they baptize themselves in rainwater. Today is Easter, and now, on this great Feast of the Resurrection, the symbols of the Incarnation are utterly transformed: The Angel has become the Cross of the Crucifixion, the Cradle has become the Tomb; and the Heart-rock Holy Child has become the Resurrected Christ, “the spiritual rock that is Christ” (1 Corinthians 10:4). Well, I see there are still no comments, and I want to say this lovely to look at and to think about. There are natural reminders of every gift “from above” all around us. It makes me more determined than ever to transform the very shabby little yard outside my side door (my hermitage used to be the attached garage to the house, and there is a big shed next to it, not a lovely landscape!) more than ever. 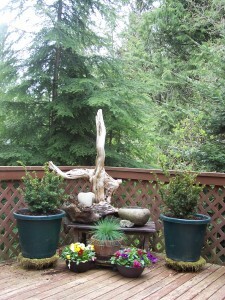 A nice trip to the coast or into the woods could provide heart-deep symbols to be a centerpiece!